1. We’re losing the battle for Vision Zero. One of the compelling aspects of the Vision Zero road safety campaign is its bold, measurable objective: we want to completely eliminate traffic deaths. That vision gives us a clear metric, but unfortunately, the data show that we’re losing ground. While the national data for 2017 aren’t in yet, the evidence from around the country is that roads deaths are up. 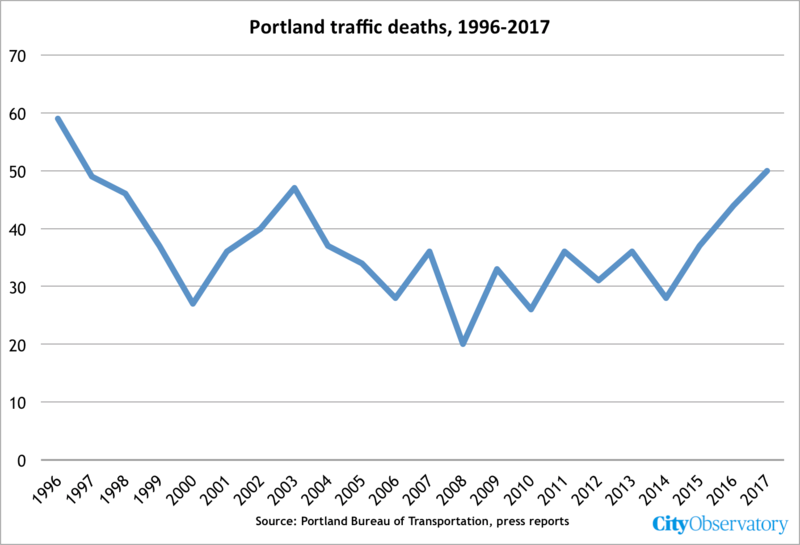 Portland recorded a nearly 60 percent increase in traffic deaths over the past three years. The prime culprit: more driving. With a decline in gas prices, driving is up, and American’s higher levels of driving are a potent reason why we have higher traffic death rates than other countries. A key aspect of achieving Vision Zero will be whether we figure out ways to reduce automobile dependence and driving. 2. Are integrated neighborhoods stable? The famous “tipping point” theory of segregation suggests that even small differences in personal preferences about the racial or economic composition of one’s neighborhood can result in a situation where if a neighborhood changes at all, it changes completely. This thinking is behind stories of white flight from the 1960s, and also underpins much of the rhetoric about gentrification: if a few newcomers move in, all the existing residents will flee (or be pushed out) and the neighborhood will flip from one kind of segregation to another. In this view, integrated neighborhoods are at best temporary phenomena. A recent study published in Journal of Urban Affairs explores whether this is actually the case. It finds that integrated neighborhoods are growing in number and tend to remain integrated over time.
. . . the drop in violence helped bring about new shifts in population, particularly in high-poverty neighborhoods. But this is not the typical story about gentrification and the displacement of the poor. This is certainly a problem in some cities, but what has been much more common is that as a neighborhood becomes safer, it attracts new higher-income residents, with no evidence of poor residents moving out. I think that’s one of the most important consequences of the crime drop and one that is often overlooked. The crime decline led to a reduction of concentrated poverty. 2. Seattle-area rents drop significantly. 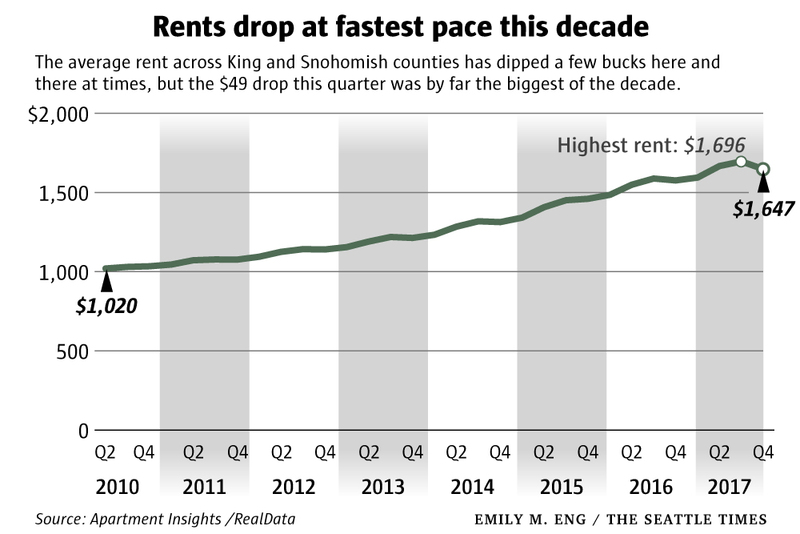 The Seattle Times reports that after years of rent inflation, the tide appears to be turning. The city has built as many apartments in the past decade as it had in the previous fifty years, with the result that housing supply is finally starting to catch up with the burgeoning Amazon-accelerated demand for urban living in the Emerald City. Average rents are down about 3 percent year over year, and the Times reports that some renters have been pleasantly surprised that rents were lower than they expected. Also: kudos to the Seattle Times for carefully explaining the source of their rental market data. 4. Rent control does more harm than good. Bloomberg’s Noah Smith has a quick, non-technical summary of recent research out of Stanford University on the effects of San Francisco’s rent control program. The research (which we profiled earlier at City Observatory), confirms what economists have long said about rent control: it prompts landlords and property owners take their property out of the rental housing market. Reducing the supply of rental housing pushes up rents in the uncontrolled segment of the market. The Stanford study shows that the savings to those who benefit from rent control are offset by the higher rents charged to others. In addition, by constricting population growth in a productive, opportunity rich place, rent control tends to reduce overall economic growth. The Boston Globe’s Dante Ramos pointed to our post on the “Illegal City of Somerville” in a column examining proposed changes to zoning in California.